The idea to paint our pirate nursery red with white polka dots was inspired by the fabric in our pirate baby bedding set! I am not sure what visitors might expect from a baby's pirate theme nursery but when I pictured the decor in my mind stripes and polka dots were not in the picture. 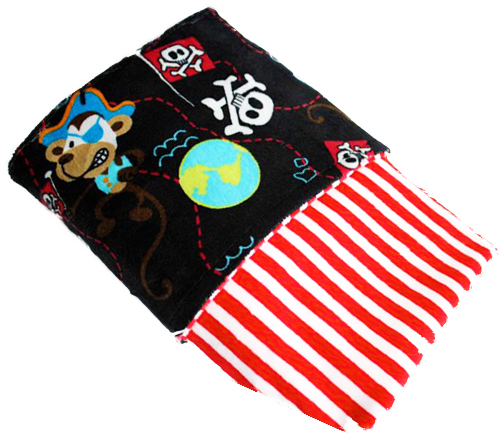 Go here to see more pirate items for your baby's nursery room offered by BrooklynGraceBabies. But when I saw the portion of the crib quilt with the fabric printed with red and white dots, I knew exactly what I wanted. We started the decorating process by painting tone on tone red stripes on the walls. Then we went back and scattered polka dots duplicating those in our pirate baby bedding set. Then we spelled our baby's name using wall letters that were custom painted to complement the other colors in the crib set including one polka dotted letter to carry out the theme. Our bold pirate baby nursery theme proves that a little paint and imagination goes a long way. Please visit Unique Baby Gear Ideas again soon to see more pirate themed decorating tips and to get the latest tips on how to decorate your baby's room in pirate themes. Join in and write your own page! It's easy to do. How? Simply click here to return to PIRATE THEME NURSERY PICTURES and DECORATING IDEAS.